The digibook release of this classic film is now under $8 at Amazon! 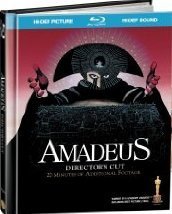 The online retailer is selling 'Amadeus: Director's Cut' (digibook) for just $7.99 (78% off suggested list price). Click here to be linked to the offer. Don't miss out adding this must own release to your Blu-ray collection for a terrific price!